Take part in a Viking feast on the fabulous sandy beach of Scapa just 2 miles south of Kirkwall. 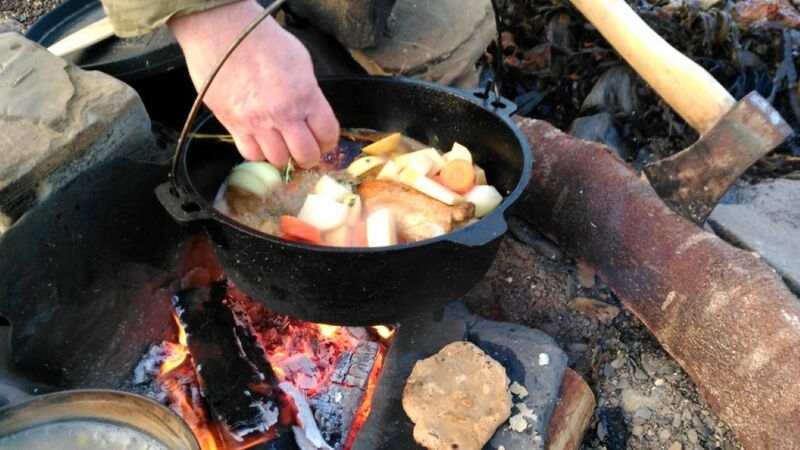 Enjoy Viking food cooked over an open wood fire. Play Viking games. Learn Viking crafts and skills. Listen to stories of Viking Orkney. Fun for all the family. Cost: £20 (adults), £10 (age 13-18 and 60+, students, disabled), £5 (age 12 and under). Includes food. Come for a Viking Feast on the Beach at the fabulous sandy beach of Scapa just outside of Kirkwall. Fun for all the family. No walking required. We meet at the car park by the beach toilets at Scapa at 6 pm. When arriving at Scapa we are met by Viking expert and storyteller Ragnhild, and outdoor cook and craftsman Mark, together give insight into everyday life in Viking Orkney. Around the campfire you will enjoy storytelling, play a Viking game, and learn Viking skills such as cooking, rune writing and tablet weaving. There will be food. We cook over open fire: Mark prepares chicken stew and vegetable soup, which we eat the Viking way. And drink from a drinking horn, naturally. You will also get the opportunity to bake your own Viking bread and make your own butter to go with it. A taste of Orkney beer will be offered to adults over 18 only. Please note that all children must be accompanied by an adult, who is responsible for them at all times. There will be open fire and water nearby. You can walk from Kirkwall. It will take you around 40 minutes to one hour. Cycle along the beautiful Crantit Trail cycle path. Take bus service 9, which leaves Kirkwall Travel Centre at 17:30. Drive and park in the car park by the Royal Oak Memorial and toilets or take a taxi. Please book the day before at the very latest, as we need to buy the right amount of food. The earlier you book, the easier you make it for us. Booking at www.brodgar.co.uk/vikinghiking Thank you!